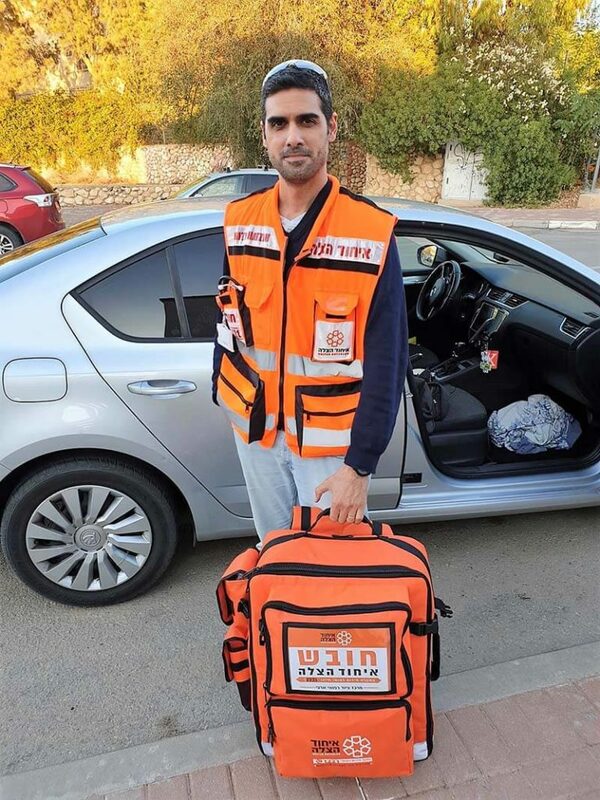 Eran Moshe is one of United Hatzalah’s dedicated volunteers in the city of Sderot who provides emergency medical services to people both in the city and the surrounding region in the troubled Gaza periphery. 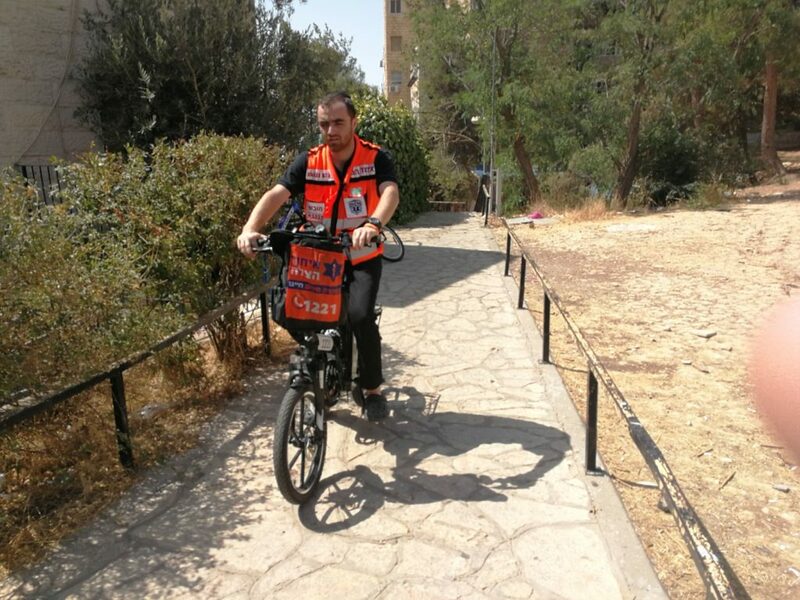 Like all United Hatzalah volunteers, all of Eran’s work is done on a volunteer basis and is completely free of charge. One recent afternoon, Eran was at his home in Sderot when he received an alert to a road accident at the entrance to the city. The devoted medic immediately dashed out of his house, jumped on his ambucycle and sped over to the location, arriving first on the scene. Two cars had collided and both drivers were injured. Eran performed a rapid assessment and turned to the more seriously injured victim, a man in his sixties. He was in severe neck pain from the harsh impact and had sustained possible spinal injuries as well. The experienced medic worked quickly as he provided initial treatment, securing the man’s neck in a brace and stabilizing his condition. He then treated the other driver, a 40-year-old man who had also been injured in the collision. By the time an ambulance arrived ten minutes later, both patients were prepped and ready for transport to the hospital. In another harrowing incident, a bus struck an 80-year-old woman by a bus stop. The bus jolted sharply to a halt as the woman fell to the ground and lay on the asphalt, groaning with pain, bleeding profusely. The alarmed passersby urgently called for help and Eran received the alert that went out from United Hatzalah dispatch center. The devoted medic immediately sped over to the location. Eran found the elderly woman suffering from numerous wounds to her head and upper body. Additional responders arrived to help Eran as he worked at a feverish pace, stemming the bleeding and bandaging the wounds. The medics affixed a neck brace, immobilized the patient, and took a complete set of vital signs. An intensive care ambulance arrived and Eran helped the crew to place the patient safely inside for emergency evacuation to the trauma center. Eran then cared for the traumatized bus passengers. One woman had sustained light injuries in the abrupt stop and she too received treatment. Everyone else, while shocked and concerned, had escaped injury. Eran stayed some time to reassure the agitated people before leaving the scene to return to his schedule. 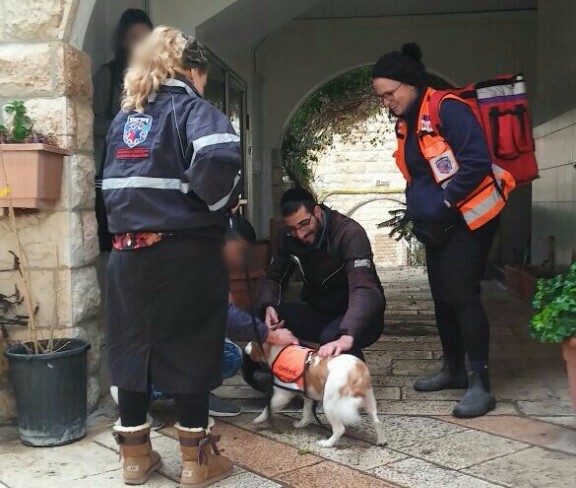 United Hatzalah’s crew of canines which operates throughout Israel just got a big push from a dog-loving donor who saw the importance of the unit’s work at traumatic medical emergencies. The unit, which has been active for the past six months and has been newly named the Sylvia and Max Shulman K-9 Unit, has just received a very large donation to the tune of $150,000. The unit currently consists of three dogs, one in the north, one in Jerusalem and one in the south. These animals and their handlers respond to calls regionally whenever and wherever they are needed. 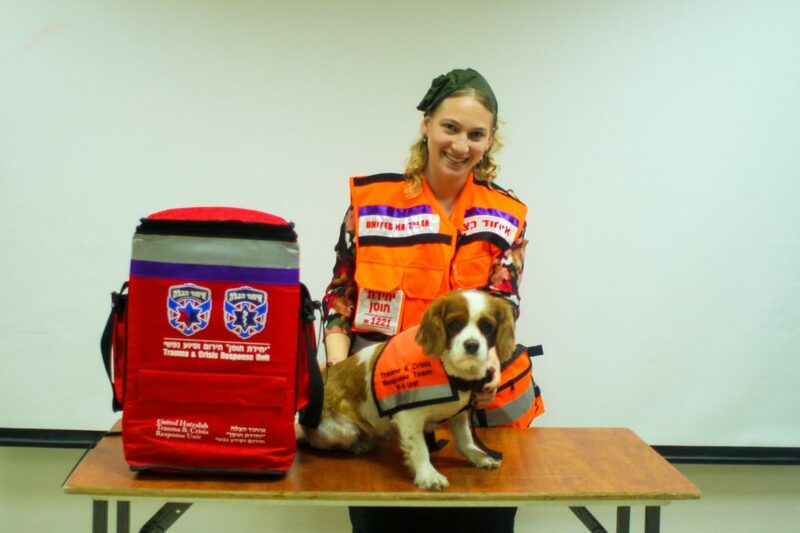 United Hatzalah’s Psychotrauma and Crisis Response Unit is now able to expand the K-9 project, which plays a significant role in providing emotional and psychological stabilization for people suffering emotional trauma due to experiencing a traumatic medical emergency. “We have been looking to expand the K-9 Unit for some time now, and are overjoyed that we have found a donor who is interested in this project and wants to help us push it forward,” said Pyschotrauma and Crisis Response Unit Director Avi Tennenbaum. The dogs have responded to building fires, searches for missing people, serious injuries, and major car accidents. “We look for the right type of situation where the dogs can add an extra level of care and treatment for the patients. Not all segments of Israel’s population react well when animals are near, so we are very careful as to which calls we send our dog unit members to. Our aim is always to make the patient feel more comfortable and empower them. In most cases, the dogs help us do that. They are brought in to assist in an emergency to help patients calm down, recover and cope with the incident that they just experienced,” Tennenbaum said. The dogs and their handlers, usually their owners, undergo specialized training that enables the dogs to become therapy dogs. For one owner and handler, Batya Jaffe, who runs the K-9 unit, her course entailed an intensive three-year training course that enables her to train others to become therapy dogs and therapy dog handlers. “One of the basic rules we learned in animal therapy is that animals don’t judge people. While some patients may be hesitant to talk with people, even therapists from our unit, that same hesitancy does not exist with Lucy, or with any of the dogs in our unit,” Jaffe said. 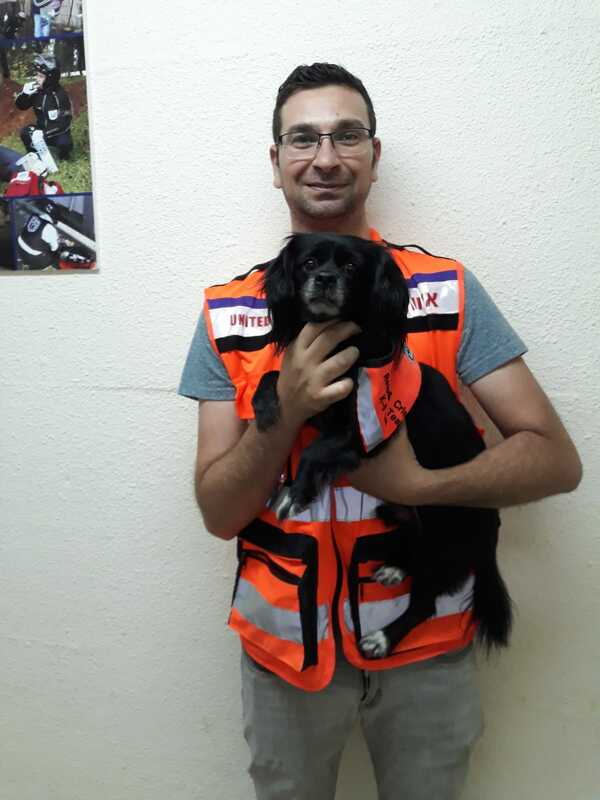 Lucy and Batya (Jerusalem/Center) – Lucy, a Cavalier King Charles Spaniel, a breed known around the world for excelling as therapy dogs, is part of the Psychotrauma Unit in Jerusalem, working with her owner and psychotrauma volunteer Batya Jaffe. Lucy has been incredibly useful in many cases where breaking the ice and connecting with patients quickly was important. 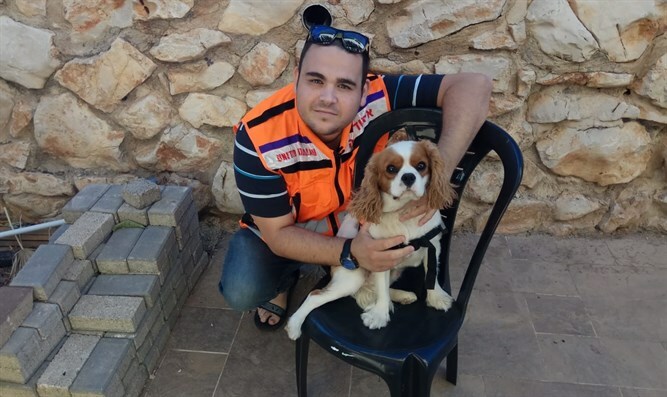 Toffy and Ori (Tzefat/North) – Toffy, also a Cavalier King Charles Spaniel, has gone through extensive training with her owner, Psychotrauma and Crisis Response Volunteer Ori Weiss. Weiss and Toffy live in the northern city of Tzefat (Safed) and have been responding to emergency calls that require an extra level of care for the past nine months. Shekel and Netanel (Be’er Sheva/South) – Shekel is a mix between a cocker spaniel and a dachshund and has gone through training together with Netanel who is a licensed animal therapist. The pair have been volunteering in the Psychotrauma Unit for almost a year. Shekel’s most serious call occurred when he successfully brought a mother back to connectivity with the outside world after one of her children suddenly passed away. The mother had been in a state of shock so severe that she was completely unresponsive. Shekel went up to her and sat on her hands and slowly through connecting with the dog, the mother came back and began responding to her surroundings once again. 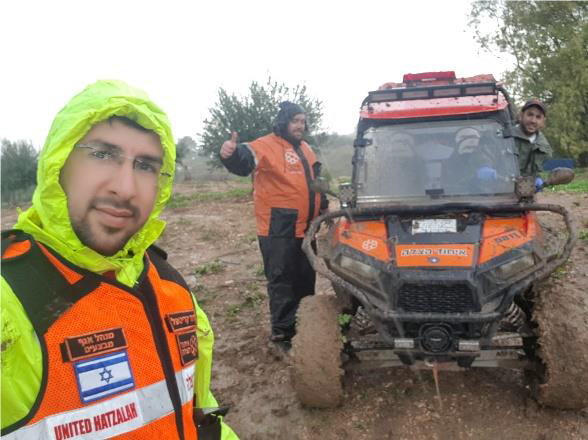 One of the lesser-known vehicles that United Hatzalah uses to save lives is the ATV or All-Terrain-Vehicle. The organization has close to 40 of these vehicles distributed across the country in locations where there is a lot of need for them, either off-road or on beaches where other vehicles, including ambulances, have a lot of difficulty traveling. 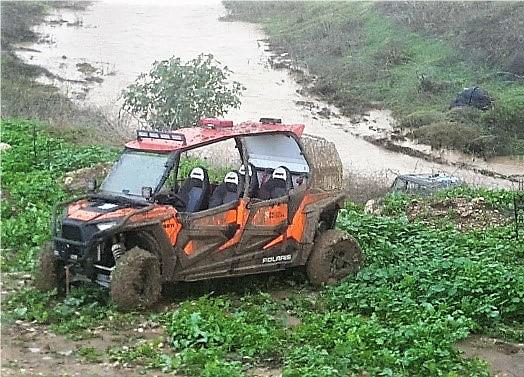 One of the organizations ATVs was called upon during the harsh winter storms that struck Israel recently. 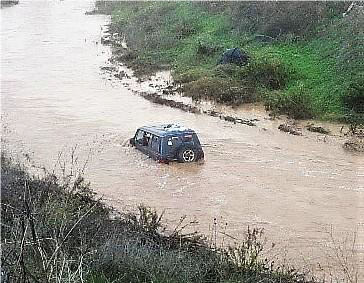 An adventurous family of five was driving in their jeep and attempting to navigate a shallow wadi (dry river bed) when a sudden downpour ensued. The rain resulted in a flash flood that caused the river to swell. The sudden rising water caused the jeep, with the family in it, to stall in the middle of the water. The family was trapped inside and could not exit the vehicle for fear of being swept away by the current. With the water level rising inside their vehicle, the father called for help. As soon as the call came in, United Hatzalah EMT Raphael Elbaz raced over in the ATV that had been stationed near his house. Upon arriving at the scene, Elbaz called to the family using a megaphone from the ATV. He instructed them to climb onto the roof of their jeep. He then tossed them a rescue line and attached the other end to the ATV. By using the vehicle as an anchor, Elbaz together with the other gathered first responders who arrived, successfully pulled all five family members to safety. Elbaz helped the family into the ATV and brought them to a United Hatzalah ambulance that was waiting to transport them to the hospital. Two of the family members were suffering from hypothermia and were shaking from the cold. EMTs in the ambulance turned on the heat and wrapped them in reflective heat blankets and a second layer of warm rescue blankets. The ambulance team then took the family to the hospital for definitive care and observation. The rescue ATV enabled the volunteers to save this family when no other vehicles could. 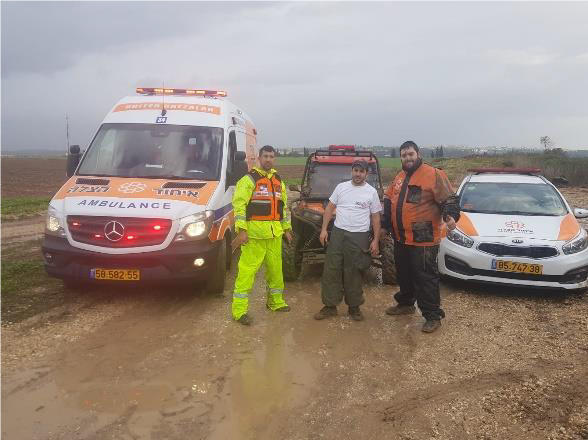 On Shabbat (Saturday, March 2nd) during the stormy morning hours, United Hatzalah volunteers EMTs from Kiryat Gat and the surrounding region were asked by the Israeli Police to participate in the search for an older gentleman who had gone missing on Friday afternoon. It was believed that the man’s life was in danger due to prolonged exposure to the elements and his previous health status. The organization received permission from its Halachik Adviser Rabbi Naftali Halperin to send out a large number of volunteers to join in the search for the missing man who was a resident of Kiryat Gat. The volunteers joined the police at their mobile command station which had been set up in the city’s police station. There they were divided up into teams and assigned search quadrants. The volunteers then spent the next number of hours searching through the city and the surrounding area, in the wind and rain in order to find and rescue the missing man. 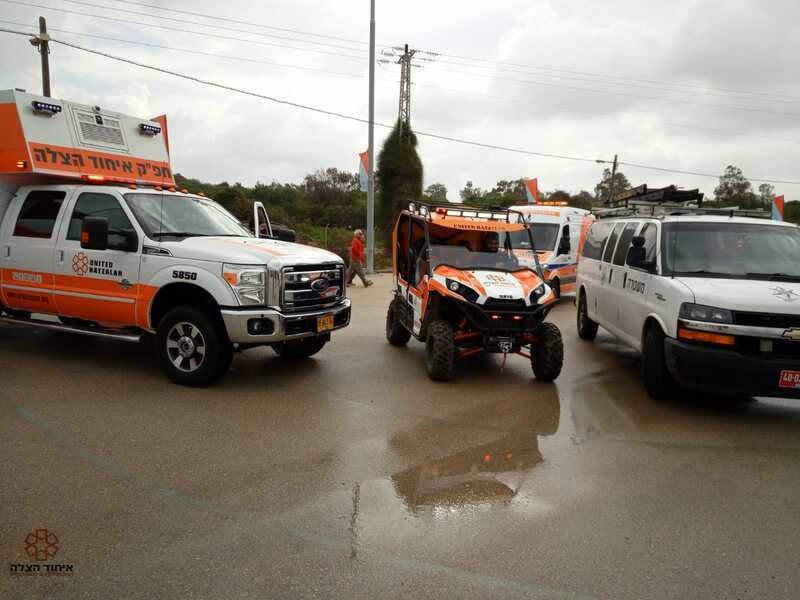 The organization utilized a variety of emergency vehicles from the city, as well as those brought in from the surrounding area including Gush Etzion and Beit Shemesh. Ambulances, ambucycles and all-terrain vehicles (ATV’s) were utilized where they could provide the most assistance. During the search and rescue operations, a call was received about a man who was laying on the ground on Malchei Yisrael street in the city. A United Hatzalah ambulance was dispatched together with the police and arrived together at the location. There they found the missing man who was fully conscious. He was suffering from a mild case of hypothermia. Together, the officers and EMTs put the man into the ambulance and dried him off from the rain and warmed him. While he was recuperating, the ambulance crew began checking his vital signs and performing medical tests in order to ascertain his level of health. Beer Sheva resident Guy Yekutiel lost his brother four years ago in a tragic accident. Following the trauma of losing his beloved brother, Yekutiel began to volunteer as an emergency medical technician (EMT) with United Hatzalah in his hometown as well as in the rest of the northern Negev. Yekutiel explained that he is volunteering to honor the memory of his brother Omer, who was just 21 years old when he died. Omer had headed out to a pub to celebrate with his friends after being accepted to Sami Shamoon College of Engineering. “Omer was on a different planet that night, he had ordered drinks for everyone in order to toast his new career path,” said Guy. In spite of the joyous occasion that evening, Omer’s hopes were never fulfilled. “He was just ordering the drinks when all of a sudden, his friends heard a boom and then saw Omer collapsed on the floor. Those nearby called for emergency services to come and it took the first responders a number of long minutes to reach Omer,” Guy recounted. When I found this our, I learned that anyone could have saved my brother’s life and prevented this crushing tragedy from affecting my family. If there had been someone who knew what they were doing at the scene, my brother might still have been with us,” Guy said. 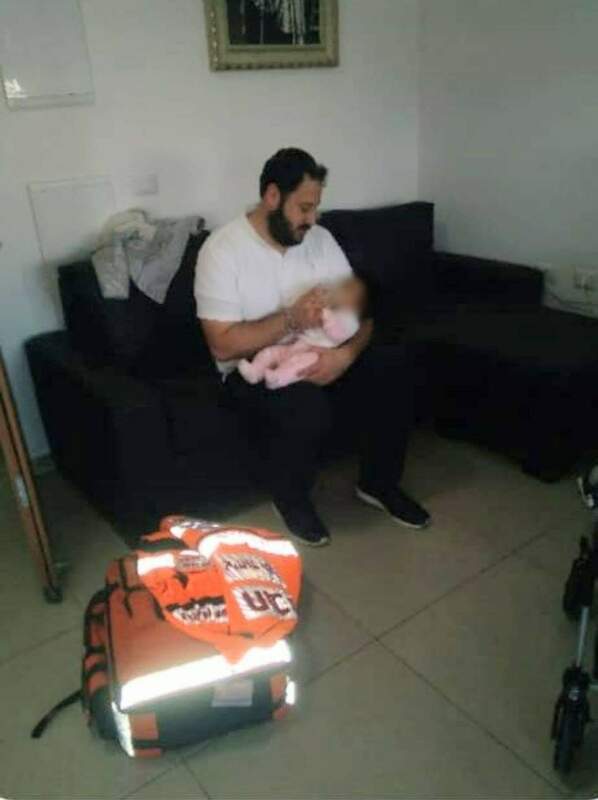 Guy works as part of the Ministry of Interior in the Negev and rushes out every day to save lives and provide medical care to those in need, all in an effort to prevent other families from going through the tragedy that he and his family experienced first hand. 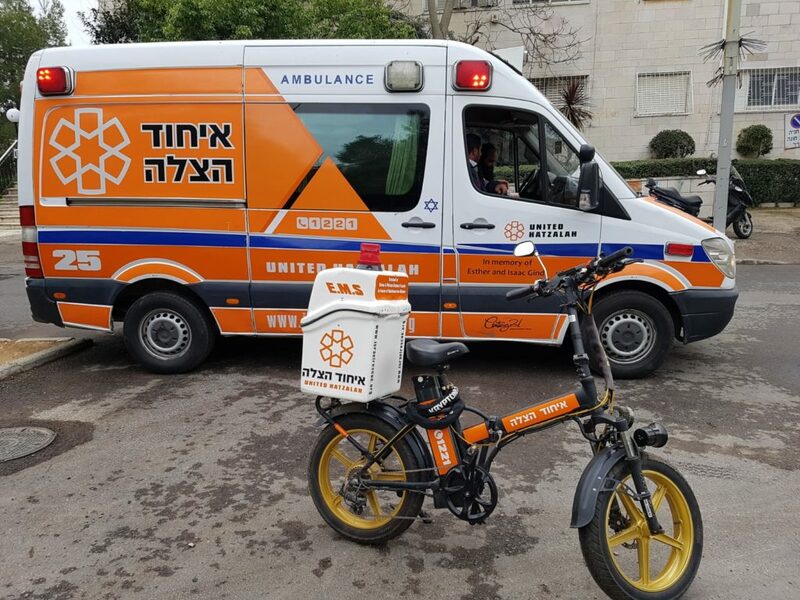 In addition to using regulars cars, ambucycles, ATVs, and other vehicles, United Hatzalah first responders also use electric bicycles. Elie Becher is one such electric bicycle rider. Through his own struggles with Crohn’s Disease, Elie was inspired to study medicine and help others. At the tender age of 20, he spends his days volunteering as a medic and working as a dispatcher at United Hatzalah’s Jerusalem headquarters. This past Friday night, an elderly woman collapsed and lost consciousness after choking on something she ate. Elie was fast asleep when he awoke to the urgent call from United Hatzalah dispatch. Elie leaped out of bed, slipped on some shoes and dashed outside to his E-bike. He zoomed through the Bet Hakerem backstreets, arriving on location three-minutes later. An ambucycle medic joined Elie at the scene to assist with rescue efforts. Hurrying inside, the pair found the 80-year-old patient unconscious, with no sign of breath or pulse. Elie and his colleague initiated emergency resuscitation protocol, interspersing chest compressions with assisted ventilations. A paramedic joined the United Hatzalah volunteers on location and focused on removing the foreign object, as the EMTs continued with CPR. Eventually, the combined team managed to secure a clear airway and restore a steady pulse. The elderly woman was loaded into an arriving ambulance and evacuated to the emergency room. Starting comprehensive CPR and re-oxygenating blood flow so close to the moment of collapse was a critical factor in saving this woman’s life. Elie’s emergency rescue provided by a generous donor to United Hatzalah made Elie’s rapid intervention possible. 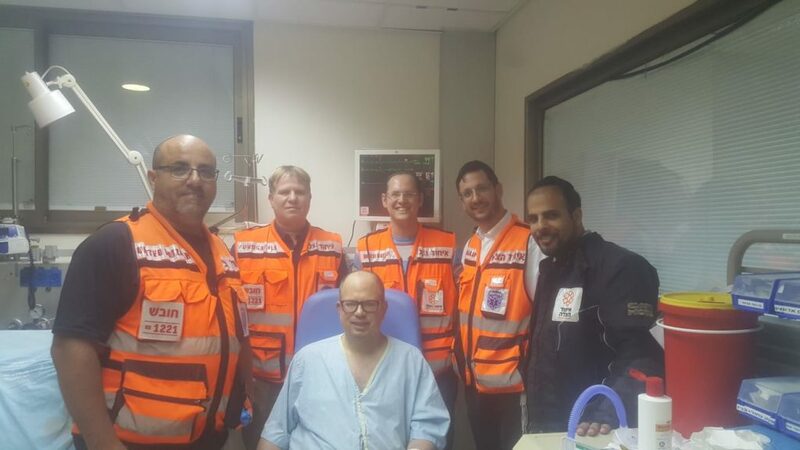 On Tuesday United Hatzalah volunteers Chezi Rosenbaum and Tom Elnadiv from Qiryat Malachi each received an alert to a medical emergency in their area. The alert would end up being a lot longer and more involved than their normal medical responses are. Both volunteers dropped what they were doing and rushed out to provide medical assistance to the injured person. When they arrived at the address of the emergency, they found a woman who had badly sliced her finger in an electric food processor. Tom and Chezi looked at each other and knew that their service was not yet done for the night. Chezi told the worried mother that she needed to head to the hospital right away, but she shouldn’t worry as he and Tom would stay to watch the children even offering to provide the baby with a bottle until its mother returned. “We are all parents and we know how to watch children and give a bottle,” Chezi said as he reassured the mother. 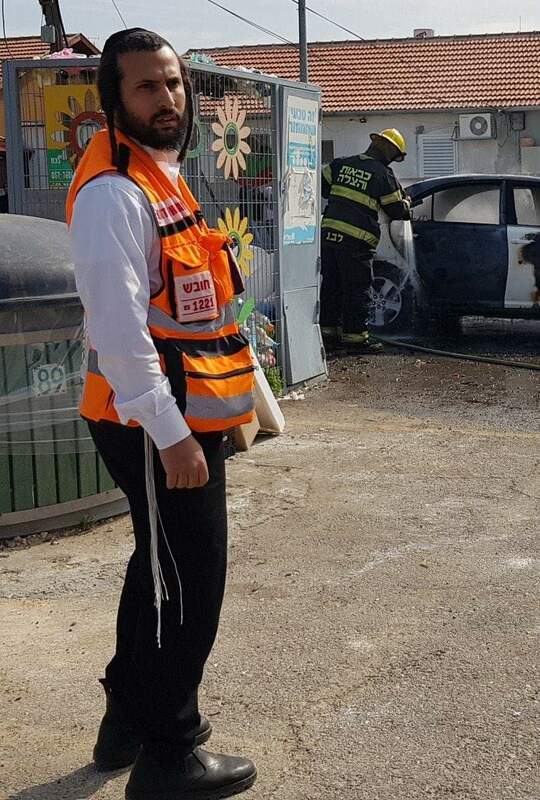 Chezi has been volunteering with United Hatzalah as an EMT for two years he himself is married and a parent and he claims that he was raised to help others whenever he could. Eli and Nir Revel who reside in Mazkeret Batya have an interesting style of how they spend their father-son bonding time. 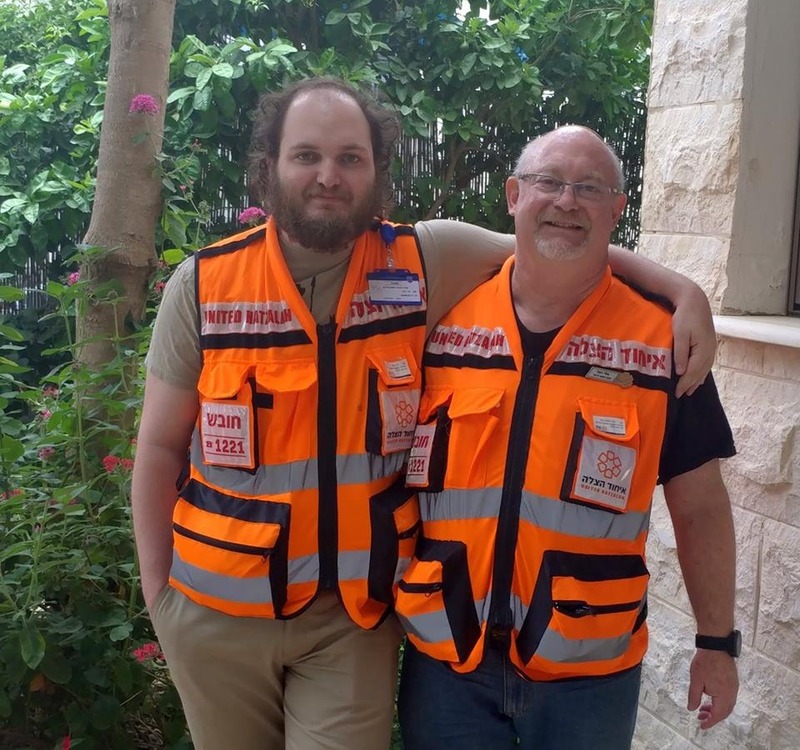 The pair volunteer together with United Hatzalah as first responders and both are trained EMTs. They respond to emergency calls on their own, and whenever they are home together they rush out as a pair in order to save lives. Nir, aged 26, was an army medic in the IDF. there he developed his love for saving lives and wanted to carry that forward when he finished his service and returned to civilian life. His passion for the field only increased when his father Eli, suffered a heart attack. Following the incident, which Eli survived, the pair decided to take an EMT training course with United Hatzalah. “We decided to take the civilian EMT training course together as a bonding experience. There I got bitten by the lifesaving bug that is the world of emergency medicine,” said Nir. 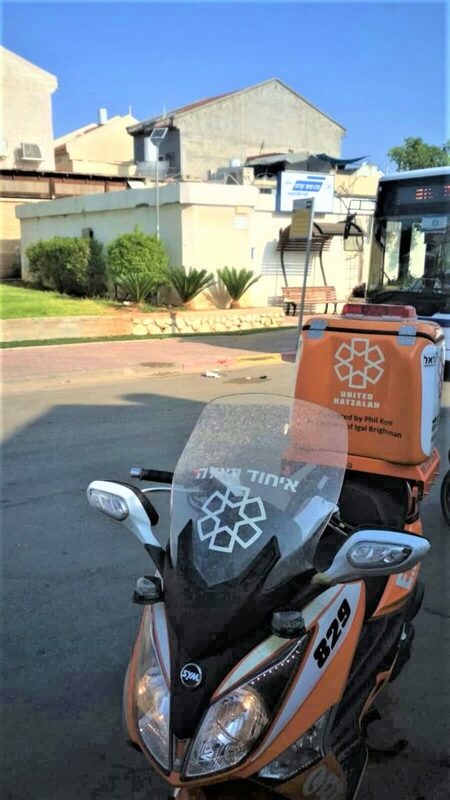 A week ago, an emergency call came in to United Hatzalah’s Dispatch center regarding a man in need of medical assistance on Hamgshimim Street in Petach Tikvah. 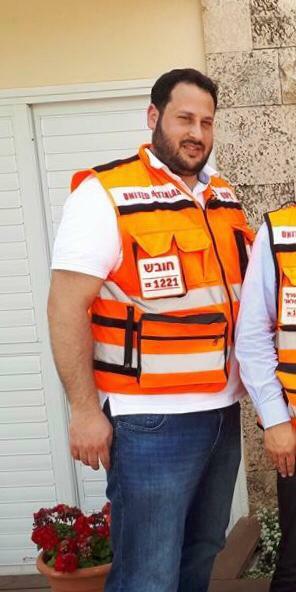 United Hatzalah volunteer EMT Shimi Ezer from Elad, was the first responder to arrive at the scene. Shimi’s office is right near where the incident took place. Shimi saw a man in critical condition who was pulseless and not breathing. Shimi immediately asked the organization’s dispatch center for backup and additional responders. He began CPR protocol as other volunteers from the surrounding area began to arrive. A few days later, Attorney Shai Jaskin woke up in the hospital. After hearing the story of his survival from his physicians, Jaskin wanted to thank the volunteers of United Hatzalah who responded so quickly and saved his life. Upon hearing of the invitation, the first responders came to the hospital to visit Jaskin.